Whether at home or in a nuclear installation, a painting job begins with surface preparation. 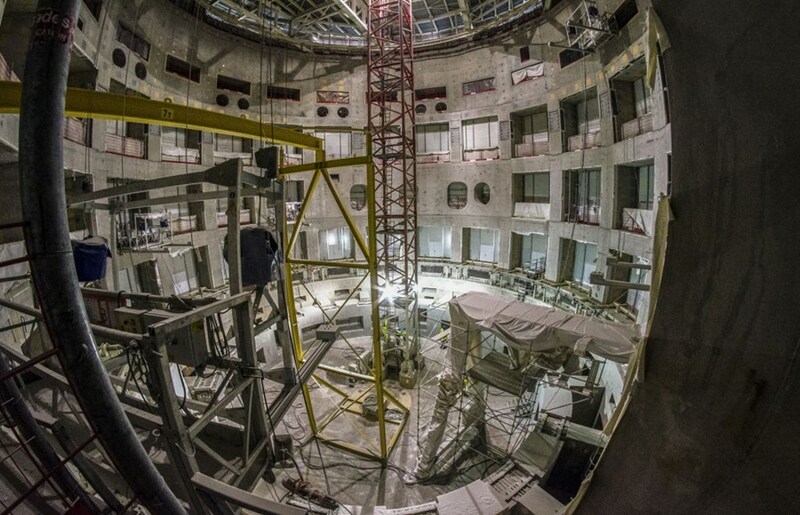 In the ITER Tokamak Pit, close to 3,000 square metres of wall need to be sandblasted prior to being coated with thick, smooth, decontaminable "nuclear paint." 30 tonnes of abrasive sand projected with high pressure on the inside wall of the Tokamak Pit have created the rough surface that optimizes nuclear paint adherence. Working in two shifts from five suspended platforms, workers have used more than 30 tonnes of abrasive sand to create a rough surface that optimizes paint adherence. The operation, which began in mid-March, should be finalized this week. Painting will begin in earnest shortly, as soon as hot air blowers have brought the vast volume of the Pit (25,000 cubic metres) to the required temperature of ~20 °C.